CBI - China: Day 146 of 154 of the Japanese Invasion of Manchuria. CBI - China: Day 14 of 41 of the 1st Battle of Shanghai. CBI - China: Day 41 of 142 of the 1st Battle of Hebei. Germany: The Gestapo is officially placed above German Law. Spain: Day 209 of 985 of the Spanish Civil War. Spain: Day 574 of 985 of the Spanish Civil War. CBI - China: Day 219 of 2,987 of the 2nd Sino-Japanese War. Day 4 of 124 of the Battle of Henan. Spain: Day 939 of 985 of the Spanish Civil War. CBI - China: Day 584 of 2,987 of the 2nd Sino-Japanese War. Finland: Day 73 of 105 of the Russo-Finnish War. CBI - China: Day 949 of 2,987 of the 2nd Sino-Japanese War. Day 88 of 381 of the Battle of South Guangxi. Day 14 of 67 of the Battle of Wuyuan. Atlantic - Iceland: While at anchor, British tanker SS EL GRILLO is attacked and sunk by three German Focke-Wulf Fw-200 Condors stationed in occupied Norway, some 1,000 miles away. ETO - UK: Day 158 of 258 of the Blitz. ETO - Netherlands: The RAF attacks the oil storage tanks at Rotterdam. 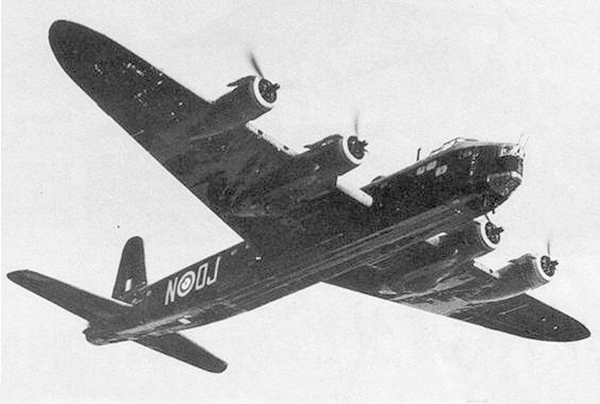 This raid sees the operational debut of the RAF's first 4-engine heavy bomber, the Short Stirling. East Africa: Day 246 of 537 of Italy's East African campaign in the lands south of Egypt. East Africa - Eritrea: Day 6 of 56 of the Battle of Keren. CBI - China: Day 1,315 of 2,987 of the 2nd Sino-Japanese War. Day 12 of 31 of the Battle of South Henan. CBI - Thailand: Day 133 of 221 of the Franco-Thai War (Vichy France vs Thailand). USA: Suggested by FDR, Congress imposes Daylight Saving Time, also called War Time, in an effort to conserve fuel by reducing the need to use artificial lighting. It will remain in effect year-round until 30 Sep 45. 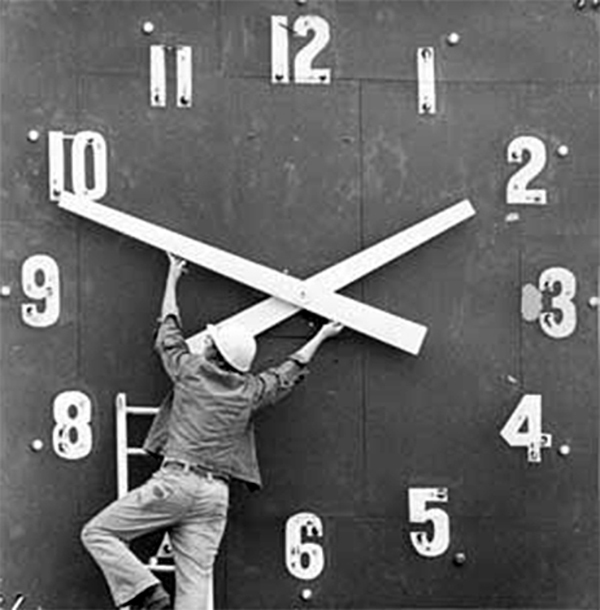 The practice of Daylight Savings Time has been both praised and criticized. Adding daylight to evenings may benefit retailing, sports and other activities that exploit sunlight after working hours, but can cause problems for evening entertainment and other occupations tied to the sun. 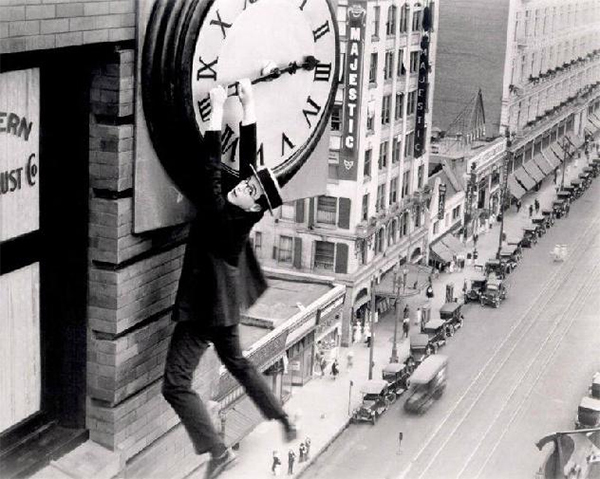 Scene from the 1924 Harold Lloyd Jr silent film classic "Safety Last" which really has nothing to do with the implementation of Daylight Savings Time during WWII, but it is comical and representative of time. "Only the government would believe that you could cut a foot off the top of a blanket, sew it to the bottom and have a longer blanket." Atlantic: Day 28 of 169 of Germany's Second "Happy Time," during which U-boats sink 609 Allied ships with little risk. Russian Front - North: Day 156 of 872 of the Siege of Leningrad. Russian Front - North: Day 3 of 102 of the Battle of the Demyansk Pocket, another failed attempt to break the siege at Leningrad. Russian Front - North: Day 19 of 103 of the Battle of the Kholm Pocket. Another attempt to break the siege at Leningrad. Russian Front - Center: Day 34 of 103 of the Battle of Vyazma, Russia. Russian Front - Center: Day 34 of 103 of the Battle of Sychevsk, Russia. Russian Front - South: Day 104 of 248 of the Siege of Sevastopol, Crimean Peninsula. All German attacks against Sevastopol are stopped for the winter. CBI - Burma: Day 59 of 164 of Japan's Invasion of Burma. CBI - China: Day 1,680 of 2,987 of the 2nd Sino-Japanese War. Day 49 of 99 of the 3rd Battle of Changsha. CBI - Java: Day 12 of 17 of the Battle of Singapore. General Wavell makes his last visit to Singapore, but by now there is nothing he can do to alter the outcome. PTO: First meeting of Pacific War Council meets in London with representatives from the Netherlands, New Zealand, Australia and the UK. PTO - Borneo: Day 57 of 107 of the Battle of Borneo. PTO - Philippines: Day 65 of 152 of the 1st Battle of the Philippines. 5th Air Force provides air support. Atlantic: German submarine U-519 is sunk northwest of Spain by a B-24 with the 2nd Anti-submarine Squadron. Russian Front - North: Day 521 of 872 of the Siege of Leningrad. Russian Front - North: Day 1 of 51 of the USSR's Operation POLAR STAR, a failed offensive north of Leningrad, hoping to take the southern shore of Lake Ladoga, Russia. Russian Front - North: Day 1 of 4 of the Battle of Krasny Bor. Soviets fail to recapture this strategically important town near Leningrad. Russian Front - North: Day 282 of 658 of the Siege of the Kholm Pocket, USSR lays siege to the Kholm Pocket but the Germans hold out for a about a year and a half. Russian Front - South: Day 61 of 69 of the USSR's Operation LITTLE SATURN. A successful drive into the Northern Caucasus and the Donets Basin pushing the Axis troops out. MTO - Tunisia: Day 86 of 178 of the Battle of Tunisia. RAF and US Air Forces provide Allied air support. CBI - Burma: Day 52 of 104 of the 1st Battle of Arakan. US 10th Air Force provides air support. CBI - Burma: Day 3 of 79 of the Allied Operation LONGCLOTH. CBI - China: Day 2,045 of 2,987 of the 2nd Sino-Japanese War. PTO - Alaska: Day 249 of 435 of the Battle of Kiska, Aleutian Islands. US 11th Air Force attacks targets on Kiska Island. PTO - Malaya: Day 357 of 357 of the Battle of Timor Island. The Japanese now have complete control of the island. ETO - France: US 9th Air Force B-26s attack V-weapon sites, the airfields at Poix and Beauvais/Tille, a bridge at Le Crotoy and a coastal battery north of the Conch River. ETO - Germany: US 8th Air Force B-17s hit the industrial area at Brunswick. Russian Front - North: Day 647 of 658 of the Siege of the Kholm Pocket. USSR lays siege to the Kholm Pocket but the Germans hold out for a about a year and a half. Russian Front - North: Day 28 of 48 of the Battle toward the Narva River, Estonia. This drive helped lift the Leningrad siege and goes on to liberate Narva. Russian Front - North: Day 9 of 191 of the Battle of the Narva Isthmus, Estonia. Russian Front - North: Day 28 of 33 of the Battle of Luga, Russia. Taking this town west of Leningrad will open the door toward Estonia. Russian Front - South: Day 49 of 113 of the USSR's Dnieper-Carpathian Offensive in southwestern Ukraine. Russian Front - South: Day 12 of 31 of the Battle of Nikopol, Ukraine. Russian Front - South: Day 18 of 25 of the Battle of the Korsun Bulge in Ukraine. Soviets lay down a tremendous artillery barrage in an attempt to force the surrender of Korsun. Russian Front - South: Day 15 of 16 of the Battles of Rovno and Lutsk, Ukraine. This Soviet victory will increase the gap in the German line from 70 to 110 miles wide. MTO - Italy: The Allies announce that southern Italy is to be handed over to Italian government jurisdiction. MTO - Italy: Day 25 of 123 of the Battle of Monte Cassino. RAF and US Air Forces provides air support for the Allied ground troops. MTO - Italy: Day 20 of 136 of the Battle of Anzio. The Germans capture Aprilia in the Anzio beachhead. RAF and US Air Forces provides air support for the Allied ground troops. CBI - Burma: Day 43 of 99 of the 2nd Battle of Arakan. CBI - Burma: Day 6 of 19 of the Battle of the Admin Box. US 10th Air Force provides air support. CBI - China: Day 2,410 of 2,987 of the 2nd Sino-Japanese War. PTO - Caroline Islands: The Japanese combined fleet leaves Truk for Palau. PTO - Marshall Islands: US 7th Air Force B-24s bomb targets in the Marshalls. PTO - New Guinea: Day 145 of 219 of the Battle of Shaggy Ridge. 5th Air Force provides air support. PTO - New Guinea: Day 142 of 162 of the Battle of the Huon Peninsula. 5th Air Force provides air support. PTO - New Guinea: Day 58 of 597 of the Battle of New Britain. US 13th Air Force provides air support. PTO - Solomon Islands: Day 102 of 295 of the Battle of the Bougainville Islands. US 13th Air Force provides air support. ETO - France: Day 194 of 284 of the Battle of Brittany. ETO - France: Day 149 of 236 of the Siege of Dunkirk. ETO - Germany: Day 145 of 145 of the Battle of Hürtgen Forest. The US 1st Army finally clears this area, bringing an end to one of bloodiest battles of the war. ETO - Germany: Day 3 of 16 of Operation GRENADE, the US drive into Germany. US 9th Army advances and crosses the southern Rur River (not to be confused with Ruhr) into Germany. US 9th Air Force provides air support. ETO - Germany: Day 3 of 17 of Operation VERITABLE, the British and Canadian drive into Germany. ETO: Day 22 of 66 of the Battle to the Rhine. US 1st Army captures the seventh and most important of the Ruhr dam. US 9th Air Force provides air support. ETO - Netherlands: US 8th Air Force B-17s carry out the first of four "Disney Bomb" missions, dropping 18 against E-boat and midget submarine pens at Ijmuiden. These are rocket boosted, concrete piercing, bunker busting bombs developed by the Royal Navy; the name for which is attributed to the Walt Disney Studios propaganda film Victory Through Air Power! that inspired the design. 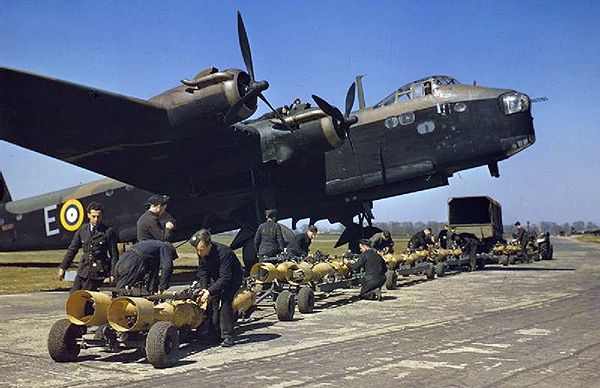 A total of 158 "Disney Bombs" will be used operationally by the end of hostilities in Europe. Russian Front - Finland: Day 149 of 223 of the Lapland War. Finland and Russia have joined forces to kick the Germans out of Finland's most northern province. Russian Front - Center: Day 119 of 206 of the Battle of the Courland Pocket in Latvia. Russian Front - Center: Day 17 of 75 of the Battle of Königsberg, East Prussia (now Kaliningrad, Russia). Russian Front - Center: Day 15 of 17 of the Battle of Rastenburg, East Prussia. Russian Front - Center: Day 16 of 63 of the Battle of the Heiligenbeil Pocket in East Prussia. Russian Front - Center: Day 1 of 54 of the Battle of East Pomerania, Germany. The goal is to take the City of Danzig and all of West Prussia. Today, a German counter-attack stops the Soviets from taking Neustett. Russian Front - Center: Day 3 of 17 of the USSR's Lower Silesian Offensive (Poland). Soviets captures Liegnitz and reach the Neisse (river) encircling Glogau. Russian Front - Center: Day 10 of 31 of the Battle of Schwedt, Germany. Russian Front - South: Day 105 of 108 of the Battle of Budapest, Hungary. About 16,000 Axis soldiers try to break out of the siege but most are killed or captured. CBI - Burma: Day 23 of 61 of the Battles of Meiktila and Mandalay. The US 10th Air Force provides air support. CBI - Burma: Day 21 of 39 of the Battle of Ramree Island. The US 10th Air Force provides air support. CBI - Burma: Day 7 of 99 of the Battle of Pakokku and Irrawaddy River operations in central Burma. The US 10th Air Force provides air support. CBI - China: Day 2,776 of 2,987 of the 2nd Sino-Japanese War. PTO - Japan: US 7th Air Force bombs targets on Iwo Jima during the afternoon. PTO - Japan: US 20th Air Force B-29s attack the Nakajima aircraft plant at Ota. PTO - New Guinea: Day 411 of 597 of the Battle of New Britain. PTO - New Guinea: Day 295 of 481 of the Battle of Western New Guinea. PTO - Philippines: Day 114 of 299 of the 2nd Battle of the Philippines, aka the Liberation of the Philippines or the Philippines Campaign. PTO - Philippines: Day 58 of 244 of the Battle of Luzon. 5th Air Force provides air support. PTO - Philippines: Day 11 of 22 of the Battle of the Bataan Peninsula. 5th Air Force provides air support. PTO - Philippines: Day 8 of 29 of the Battle of Manila.